Use a chair with a horizontal seat (or at least as horizontal as possible). A plain wooden chair will do perfectly. Your lower legs are perpendicular to the floor. Make sure that the angle between your thighs and lower legs is 90 degrees. If you’re rather short, you can use a cushion, thick book or folded blanket to place your feet on. If you’re tall, you can heighten the seat by placing a folded blanket or cushion on top of it. Erect your spine. Don’t lean on the back rest of the chair. Sitting straight like this might feel a bit uneasy, as most of us tend to sit slouched. Maintaining a straight spine could take some effort in the beginning, but excessive strain should be avoided. Relax your shoulders and arms. 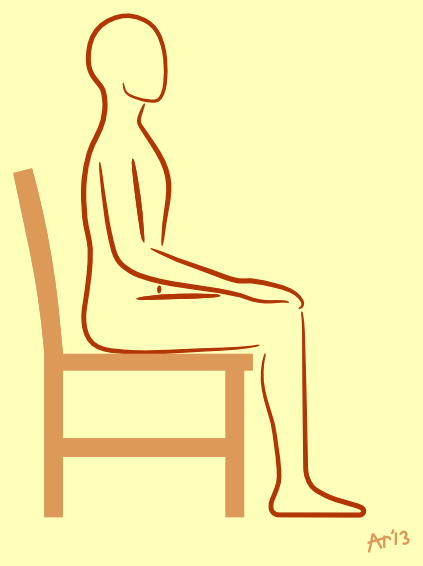 Feel the contact between your sitting bones and the seat. If you find it hard to straighten your spine without getting tensed, some imagery might be of help. You can imagine that somebody’s pulling you upwards with a string attached on top of your head. Or you can think of a child playing with blocks in kindergarten. The child likes to pile them up from bottom to top. Imagine that you’re piling up the vertebras in your spine the same way. These imageries should give you a feel of how to sit naturally straight. You can use a cushion or folded blanket to support your forearms1. That makes it easier to let the palm of your hands face upwards. Open hands with palms facing upwards express openess and willingness to accept life the way it is. It’s especially convenient for when you want to perform mudras2. Supporting the forearms with a folded blanket or cushion. 2 Mudras are specific yogic hand positions. It’s believed that mudras affect the flow of subtle energy in the body. This entry was posted in Uncategorized and tagged meditation posture, sitting position by admin. Bookmark the permalink.